A life on the ocean wave – first impressions #narrowboat #england – The Diesel-Electric Elephant Company. I am still in the low-rise tenement of the marina for the moment, but this is the new view from my pointy-end (since turning the Cardinal around, more of which later…). Should you ever live in close proximity to a couple of swans do not be fooled. They are miserable, foul-tempered things that leave squidgy-green poops all over the place of sufficient size even to intimidate a free-format pooping Great Dane*. *When I say “Great Dane” I refer to the breed of dog; I am in no way casting a slur upon the domestic personal habits of Sigismund Poopalottuh, the gentleman from Denmark. Work on the Cardinal continues a-pace, and there will thus be no interior photographs yet, since the interior looks merely like a floating workshop and will do so for a while. The old name has gone. I knew exactly what to do with a problem like Moorea – I sanded it down and put three coats of paint over it. I put these on by hand – having a narrowboat professionally sprayed runs to thousands of quids, and this is but one panel so I’m savin’ me munney! The new name is partly in place – still awaiting the edge panel tape. This will be in silver-grey, to match the lettering. Plumbery checked and tickled, leaks fixed, new pressure-accumulator fitted, immersion-heater wired in, new kitchen taps (nice “surgical” swingy-lever ones to replace the previous anti-grip nonsenses). Wiring traced and checked and jobs listed, all lights changed to uber-economical LED fittings, new switches (flashy reflective panels), new sockets including provision for (to be fitted soon) 12v “car” style sockets, sockets with built-in USB charge points scattered around, some huge problems with the basic layout of the wiring fixed, isolation transformer fitted, new mains switch-bank fitted and working. Loads more to do in that line too, but we’re getting there. No television – I will not have one, I object to the cr*p shown and to the “news” stations incredibly unprofessional approach and massively partisan bias, but the monitor for the DVD player has been nailed to the wall. Curtains; gone all but for the doors, replaced with neat, low-profile black-out blinds. Windows all treated with blue-reflective one-way security film, a couple of new catches fitted. Mushroom vents half replaced with super-futuristic “Breezies”; little flying-saucer things with proper bug screens, floating ball waterproofing and electric forced ventilation at the swick of a flitch. New unpowered vents to meet regulations, with proper up and over ducting for the low-level vents. Gas remote shut-off and bubble-tester fitted into a freshly painted and rubber-mat lined gas locker. Preparations made for not one but two entirely independent gas alarms. Gas cooker and diesel central heating serviced by a wholly qualified gentleman and now working nicely. Both old smoke alarms swapped out for new combined smoke and CO detectors. Batteries removed, battery box restored and re-sited to save on about five metres of highly unnecessary cable (all the better for winter starting) and refitted with properly-made, properly-sized cables (all the kinder to the battery bank and better for starting too). The great loose coil of red cable in the photo is for removing once other work has been done at the far end of those cables, so there’ll be less unnecessary cable there too. Proper through-bulkhead connections are being made for all, and the old holes sealed up… and, yes, the bottom of the engine bay is on the list for de-gunking and repainting! The batteries will also be out again for physical cleaning to get rid of the marks left by being sat sitting in condensation. Engine stripped down, hoses removed and about to be replaced, skin cooling-tanks back-flushed, new looms for the engine and a new instrument panel and set of switchgear about to go in during the coming weeks. This will mean that I no longer rely on an engine-stop button covered in Duct Tape… Alternators removed and checked, to be cleaned and added on the rebuild with the belts properly aligned (they were at all sorts of angles hitherto, and the engine was eating belts alive). Half of the engine bay re-painted, half prepared ready and the final half awaiting any attention at all. Solar panels fitted to the roof, ready to be wired in when the wiring in the main cabin gets tickled. Part of the new control panel will be a control system display for these, the battery bank will get an all-singing all-dancing monitor system (one that will interface with my laptop, so that I can check it from the comfort of the study area). Mains shore power socket replaced and relocated to somewhere that doesn’t require gymnastics to reach, new shore-power cables made up in the correct cable spec. Carpet has been applied throughout to sides below the gunwale line, and to the insides of drawers and cupboards. The old floor-carpet is removed, ready for new wood flooring to go down once we’re not heaving Workmates about and sawing things up inside. Artwork on the walls remains to be replaced, I think I’m going to get some of my own photos (as in photos wot I has took, not photos of me) printed and mounted to replace the stuff that’s there. Dinette to study conversion remains to be done… more sockets, more bookshelves and a solid table in place of the now-it’s-up now-it’s-down-without-human-intervention folding thing. New LED tunnel lights, new horn (there wasn’t an “old” horn…), deck flood-lights and river navigation and anchor lights all purchased and plans afoot (we still work in Imperial here, and a-metre sounds too odd). So, aside from that the Bro and I have been doing sweet Fanny Adams, as they say. Oh yep – I’ve bought new rubber matting to go down in the well deck, but again that will wait until we’ve stopped sawing things up and painting. There are some gubbins on the roof, the gangplank and boathook and a selection of bargepoles (literally) that need sanding down and painting (in a colour that makes them blend in) – I want the roof to remain as clutter-free as possible. Oh aye, and the surround to the stove will, sometime, be replaced with slabs of granite or similar, to replace the old blue tiles. New mattress is in place, bed has been re-built, everything has a layer of air-circulation mesh under it (and damned splendidly comfortable the bed is too)! Two massive boxes of sound-proofing slabs have also arrived (adding, while stored – “stored” – to the “workshop” look of the interior). These will grace the new engine-bay cover and the bulkhead, adding a touch of shush to the engine while cruising. All of this technical work has been or will be documented and photographed, and full details will be added here in a separate stream, reference for the use of. So, what’s the Cardinal like to live on? It’s cold, windy and raining outside. I am sitting here on the interwebnet, next to the red-glow of my multi-fuel stove (currently on a mix of logs and boat-coal, bought from a passing fuel-boat chugging along the canal), digesting a sunday lunch of curry wot I done cooked mineselfs, feeling clean from a steaming-hot shower in my splendid full-size shower-cubicle and looking forward to opening a bottle of Soave from the fridge as soon as the clock ticks past “respectable enough”. I can hear the occasional narrowboat working hard to get back into their home mooring, the occasional mainline Virgin Express train speeding past and once in a while I can just make out an aeroplane heading into or out of Manchester airport. Later on I am going to watch an old DVD or something, since it’s Sunday and I am as knackered as I am ugly. What’s it like to sleep on a narrowboat? Don’t know about most, but mine is pure, sybaritic luxury – a cosy cabin with portholes, a massively comfortable mattress and the whole thing is like a waterbed, except that the whole home is afloat and rocking gently. Last night I could hear occasional slapping water, owls hooting as they hunted and absolutely nothing else. No doubt the whole marina was treated to my extra special “pig and whistle” classic snoring. The turning around mentioned at the beginning? That was an experience and a quarter. Since His Almost-Majesty’s main engine is currently partially dimantled (and because I needed access to the other side of the Cardinal, painting and naming for the use of) the Bro accomplished the turning by hand, using the ropes. 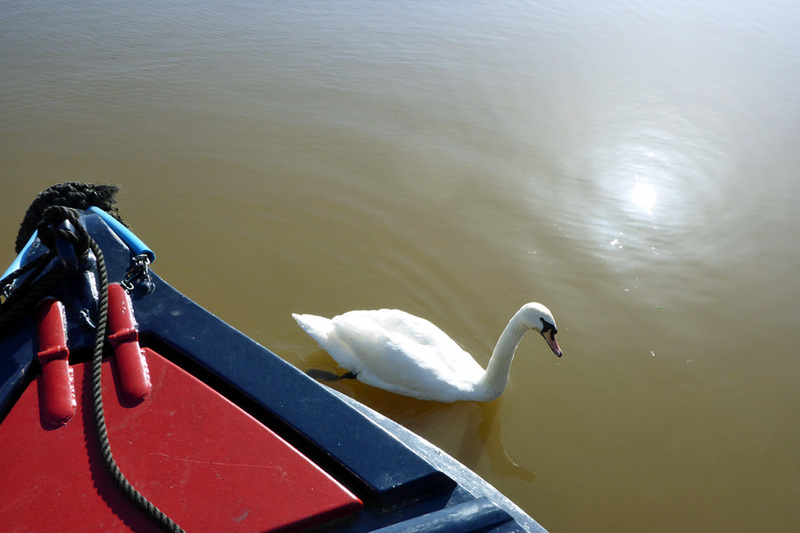 A gentle back out of my narrow mooring into the open water, a persuasion of the bows in one direction and the stern in the other, all followed by a reversing back into the mooring bay. I spent the entire experience aboard, just in case, although there was precious little I could do – I discovered that my very, very long bargepole wasn’t long enough to find bottom… Instead of doing anything useful I found myself pushing against the boat – while, uselessly, stood on it, and willing the Cardinal to turn! Tis done now and t’was done with some style. I moved onboard during an English February, and it’s now almost the end of April and not quite so… cool as February was. Some days have indeed been very warm, and during an English summer the electric fan vents and the solar properties of the window film should help with keeping me in my fussy-as-hell one or two degree “comfort zone”. The next vast, vertical wall learning curve is more moving – in fact it will be constant moving, as I hop around England’s 2,000 miles of canals and accessible rivers, seeing what’s what and checking that it’s all being kept up to standard. Inbetween DIYing and such I am trying my hardest to get on with finishing the next book (The Dog With The Bakelite Nose) AND the rest on my list of book to-do task AND to come up with a book of canal-based stories. Send me some spare time! Send me some spare energy! Do not do what one of my erstwhile NB Buddies did once with his nice new Narrow boat. He decided to fit some bookshelves and went with all the best intentions to do a proper job! He measured, aligned, measured again, cut and attached the bookshelf to his nice new bulkhead ensuring that it was level using his trusty spirit level. He filled his bookshelves with his best books, some priceless tatt (ornaments) and then went off to fill the water tanks with water, and fuel tanks with water. Prompting a dull thud, crashing of said tatt and much cursing and anguish from other parties (wife of buddy who owned the priceless tatt). The level of the boat had moved, and no books or priceless tatt could ever be stored on these fitted bookshelves. Never use a spirit level on a boat, unless you need a long straight edge. Added tip, at no extra cost. when at the DIY store, get a set of masonry bits. You may think you may not require one on a metal boat – but I learnt from bitter experience that one is most definitely needed if you are fitting a very heavy wood burner to the floor – which is supported on flagstones. Sounds idyllic after so much hard work. Book shelves are very important! Sending you loads of energy to get it all complete. There’s nothing quite so nice as rows upon rows of books, books read and books waiting to be read! The Cardinal will be stuffed with them, thank you! In other words, you scooped out the poor old Cardinal’s innards and a good bit of his outards and replaced all. Hardly even the same boat! Sounds like a heavenly space, though. If you haven’t read THREE MEN IN A BOAT, do so instanter! I look forward to reading your adventures. Due to the current exchange rate, I may not be able to go your bail, but I’ll be happy to chip in. Lots still to do, but I must say, it’s fantastic waking up to ducks drifting past! Sounds delightful. Your experiences will be followed with interest by landlubbers (and other lubbers too, no doubt). That will make a nice change; usually my experiences are just followed by the Police! How wondrous and tiring to read! Glad the bed is comfortable with all that work you need it! I marvel at how you know to do all those things. When I read your progress I’m thinking of murder and mystery afloat and can’t wait for more canalside pics. The set of Mablethorpe has me writing my new fictitious seaside series Echoes of Doubt – I have my eye on one of the pics as a book cover! (Negotiate, negotiate!) Keep it coming! Excellent! Spare time gratefully received and put to immediate good use, thank you! My word, it sounds very exciting. The new name-plate is so much more elegant than the last one. I don’t understand much of what the gubbins are but am certain that they are necessary and that you will get the hang of it all in a short space of time. I wish you luck m’dear!